You will know you are at Falling Waters when you arrive and see the waterfalls that they are known for at the entrance of the community! 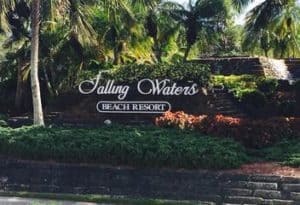 Upon entering this gated community, you will find yourself in a fantastic environment filled with 2 bedroom and 2 bath units and great water views. The clubhouse of this community is also home to a pool, library, kitchen, tennis courts, bocce ball, and more. Don’t forget about the lazy river pool in this community as well!